Hebron, located in the Judean hills south of Jerusalem, is the site of the oldest Jewish community in the world, dating back to Biblical times. Today, Hebron is home to some 250,000 Palestinians and approximately 700 Jews. An additional 6,000 Jews live in the adjacent community of Kiryat Arba. Distinction between "H1" & "H2"
Hebron (Al-Khalil in Arabic) is located 32 kilometers south of Jerusalem and is built on several hills and wadis, most of which run north- to-south. The Hebrew word Hebron is explained as being derived from the Hebrew word for friend ( haver ), a description for the Patriarch Abraham. The Arabic Al- Khalil, literally the friend, has a nearly identical derivation and also refers to Abraham (Ibrahim), whom Muslims similarly describe as the friend of God. Hebron is one of the oldest continually occupied cities in the world, and has been a major focus of religious worship for over two millenia. 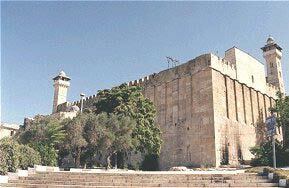 Hebron has a long and rich Jewish history and is the site of the oldest Jewish community in the world. The Book of Genesis relates that Abraham purchased the field where the Tomb of the Patriarchs is located as a burial place for his wife Sarah. This was the first parcel of land owned by the Jewish people in their Promised Land. According to Jewish tradition, the Patriarchs Abraham, Isaac and Jacob, as well the Matriarchs Sarah, Rebecca, and Leah are all buried in the Tomb. King David was anointed King of Israel in Hebron, and he reigned in the city for seven years. One thousand years later, during the first Jewish revolt against the Romans, the city was the scene of extensive fighting. Jews lived in Hebron continuously throughout the Byzantine, Arab, Mameluke and Ottoman periods and it was only in 1929 that the city became temporarily "free" of Jews as a result of a murderous Arab pogrom in which 67 Jews were murdered and the remainder forced to flee. After the 1967 Six-Day War, the Jewish community of Hebron was re-established. Today, Hebron has a mostly Sunni Muslim population and its Jewish community is comprised of roughly 700 people, including approximately 150 yeshiva students. An additional 6,650 Jews live in the adjacent community of Kiryat Arba. Hebron's climate has, since Biblical times, encouraged extensive agriculture and such areas surround the city. Farmers in the Hebron region usually cultivate fruits such as grapes and plums. In addition to agriculture, local economy relies on handicraft, small- and medium-scale industry and construction. Hebron is one of the most important marketplaces in the Palestinian Territories. Numbers 13:22 states that (Canaanite) Hebron was founded seven years before the Egyptian town of Zoan, i.e. around 1720 BCE, and the ancient (Canaanite and Israelite) city of Hebron was situated at Tel Rumeida. The city's history has been inseparably linked with the Cave of Machpelah, which the Patriarch Abraham purchased from Ephron the Hittite for 400 silver shekels (Genesis 23), as a family tomb. As recorded in Genesis, the Patriarchs Abraham, Isaac, and Jacob, and the Matriarchs Sarah, Rebekah and Leah, are buried there, and — according to a Jewish tradition — Adam and Eve are also buried there. Hebron is mentioned 87 times in the Bible, and is the world's oldest Jewish community. Joshua assigned Hebron to Caleb from the tribe of Judah (Joshua 14:13-14), who subsequently led his tribe in conquering the city and its environs (Judges 1:1-20). As Joshua 14:15 notes, "the former name of Hebron was Kiryat Arba..."
Following the death of King Saul, God instructed David to go to Hebron, where he was anointed King of Judah (II Samuel 2:1-4). A little more than 7.5 years later, David was anointed King over all Israel, in Hebron (II Samuel 5:1-3). The city was part of the united kingdom and — later — the southern Kingdom of Judah, until the latter fell to the Babylonians in 586 BCE. Despite the loss of Jewish independence, Jews continued to live in Hebron (Nehemiah 11:25), and the city was later incorporated into the (Jewish) Hasmonean kingdom by John Hyrcanus. King Herod (reigned 37-4 BCE) built the base of the present structure — the 12 meter high wall — over the Tomb the Patriarchs. The city was the scene of extensive fighting during the Jewish Revolt against the Romans (65-70, see Josephus 4:529, 554), but Jews continued to live there after the Revolt, through the later Bar Kochba Revolt (132-135 CE), and into the Byzantine period. 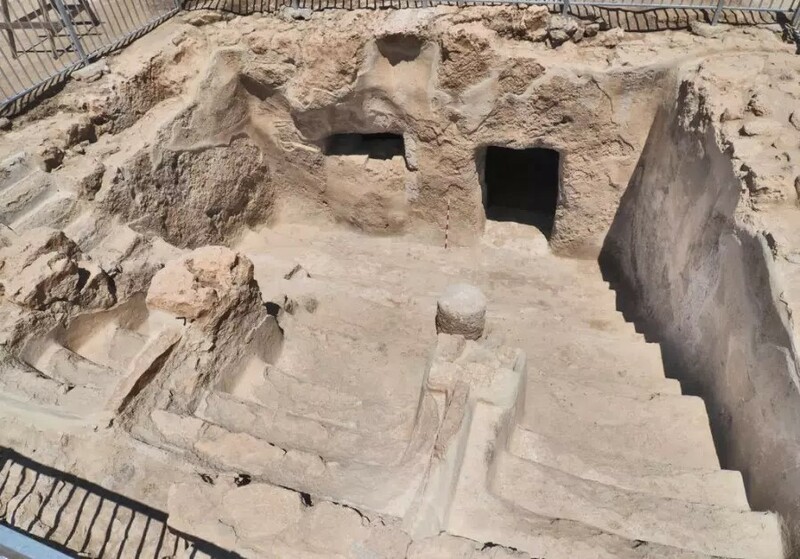 The remains of a synagogue from the Byzantine period have been excavated in the city, and the Byzantines built a large church over the Tomb of the Patriarchs, incorporating the pre- existing Herodian structure. In October 2018, a new archaeological site opened at Tel Hebron where the walls of the city from the Early and Middle Bronze Age were excavated, as well as buildings from the Early Roman period, including pottery vessels, jewelry and coins. Workshops from the First Temple period, including wine and olive presses, pottery kilns and huge vessels for the production of wine and oil were also discovered. Other findings include a four-chamber house, jars bearing ancient Hebrew inscriptions with words “to the king of Hebron” and a section of the city wall. Jews continued to live in Hebron after the city's conquest by the Arabs (in 638), whose generally tolerant rule was welcomed, especially after the often harsh Byzantine rule — although the Byzantines never forbade Jews from praying at the Tomb. The Arabs converted the Byzantine church at the Tomb the Patriarchs into a mosque. Upon capturing the city in 1100, the Crusaders expelled the Jewish community, and converted the mosque at the Tomb back into a church. The Jewish community was re-established following the Mamelukes' conquest of the city in 1260, and the Mamelukes reconverted the church at the Tomb of the Patriarchs back into a mosque. However, the restored Islamic (Mameluke) ascendancy was less tolerant than the pre-Crusader Islamic (Arab) regimes — a 1266 decree barred Jews (and Christians) from entering the Tomb of the Patriarchs, allowing them only to ascend to the fifth, later the seventh, step outside the eastern wall. The Jewish cemetery -- on a hill west of the Tomb — was first mentioned in a letter dated to 1290. Despite the events of 1517, its general poverty and a devastating plague in 1619, the Hebron Jewish community grew. Throughout the Turkish period (1517-1917), groups of Jews from other parts of the Land of Israel, and the Diaspora, moved to Hebron from time to time, joining the existing community, and the city became a rabbinic center of note. In 1775, the Hebron Jewish community was rocked by a blood libel, in which Jews were falsely accused of murdering the son of a local sheikh. The community -- which was largely sustained by donations from abroad -- was made to pay a crushing fine, which further worsened its already shaky economic situation. Despite its poverty, the community managed, in 1807, to purchase a 5-dunam plot -- upon which the city's wholesale market stands today -- and after several years the sale was recognized by the Hebron Waqf. In 1811, 800 dunams of land were acquired to expand the cemetery. In 1817, the Jewish community numbered approximately 500, and by 1838, it had grown to 700, despite a pogrom which took place in 1834, during Mohammed Ali's rebellion against the Ottomans (1831-1840). In 1870, a wealthy Turkish Jew, Haim Yisrael Romano, moved to Hebron and purchased a plot of land upon which his family built a large residence and guest house, which came to be called Beit Romano. The building later housed a synagogue and served as a yeshiva, before it was seized by the Turks. During the Mandatory period, the building served the British administration as a police station, remand center, and court house. In 1893, the building later known as Beit Hadassah was built by the Hebron Jewish community as a clinic, and a second floor was added in 1909. The American Zionist Hadassah organization contributed the salaries of the clinic's medical staff, who served both the city's Jewish and Arab populations. During World War I, before the British occupation, the Jewish community suffered greatly under the wartime Turkish administration. Young men were forcibly conscripted into the Turkish army, overseas financial assistance was cut off, and the community was threatened by hunger and disease. However, with the establishment of the British administration in 1918, the community, reduced to 430 people, began to recover. In 1925, Rabbi Mordechai Epstein established a new yeshiva, and by 1929, the population had risen to 700 again. A total of 59 of the 67 victims were buried in a common grave in the Jewish cemetery (including 23 who had been murdered in one house alone, and then dismembered), and the surviving Jews fled to Jerusalem. (During the violence, Haj Issa el-Kourdieh -- a local Arab who lived in a house in the Jewish Quarter -- sheltered 33 Jews in his basement and protected them from the rioting mob.) However, in 1931, 31 Jewish families returned to Hebron and re-established the community. This effort was short-lived, and in April 1936, fearing another massacre, the British authorities evacuated the community. Following the creation of the State of Israel in 1948, and the invasion by Arab armies, Hebron was captured and occupied by the Jordanian Arab Legion. During the Jordanian occupation, which lasted until 1967, Jews were not permitted to live in the city, nor -- despite the Armistice Agreement -- to visit or pray at the Jewish holy sites in the city. Additionally, the Jordanian authorities and local residents undertook a systematic campaign to eliminate any evidence of the Jewish presence in the city. They razed the Jewish Quarter, desecrated the Jewish cemetery and built an animal pen on the ruins of the Avraham Avinu synagogue. Israel returned to Hebron in 1967. The old Jewish Quarter had been destroyed and the cemetery was devastated. Since 1968, the re-established Jewish community in Hebron itself has been linked to the nearby community of Kiryat Arba. On April 4, 1968, a group of Jews registered at the Park Hotel in the city. The next day they announced that they had come to re- establish Hebron's Jewish community. The actions sparked a nationwide debate and drew support from across the political spectrum. After an initial period of deliberation, Prime Minister Levi Eshkol's Labor-led government decided to temporarily move the group into a near-by IDF compound, while a new community -- to be called Kiryat Arba -- was built adjacent to Hebron. The first 105 housing units were ready in the autumn of 1972. In the decade following the Six Day War, when the euphoria of the victory had subsided, Judea and Samaria were still largely unsettled by Jews. Rabbi Moshe Levinger and a group of like-minded individuals determined that the time had come to return home to the newly liberated heartland of Eretz Yisrael. “As their first goal, the group decided to renew the Jewish presence in the the Jewish People’s most ancient city, Hebron. Word of the decision spread quickly and soon a nucleus of families was formed. Their objective: to spend Pesach in Hebron's Park Hotel. Hebron's Arab hotel owners had fallen on hard times. For years they had served the Jordanian aristocracy who would visit regularly to enjoy Hebron's cool dry air. The Six Day War forced the vacationers to change their travel plans. As a result, the Park Hotel's Arab owners were delighted to accept the cash-filled envelope which Rabbi Levinger placed on the front desk. In exchange, they agreed to rent the hotel to an unlimited amount of people for an unspecified period of time. “The morning of Erev Passover, April, 1968 saw the Levinger family along with families from Israel's north, south and center packed their belongings for Hebron. They quickly cleaned and kashered the half of the hotel's kitchen allotted to them and began to settle in. Women and children slept three to a bed in the hotel rooms, while the men found sleeping space on the lobby floor. At least Ya'akov Avinu had a rock to place under his head, remembered one of the men in dismay. The Jewish community in Hebron itself was re-established permanently in April 1979, when a group of Jews from Kiryat Arba moved into Beit Hadassah (see page 2 above). Following a deadly terrorist attack in May 1980 in which six Jews returning from prayers at the Tomb of the Patriarchs were murdered, and 20 wounded (see Annex I below), Prime Minister Menachem Begin's Likud-led government agreed to refurbish Beit Hadassah, and to permit Jews to move into the adjacent Beit Chason and Beit Schneerson, in the old Jewish Quarter. An additional floor was built on Beit Hadassah, and 11 families moved in during 1986. Since 1980, other Jewish properties and buildings in Hebron have been refurbished and rebuilt. Today the Hebron Jewish community comprises 19 families living in buildings adjacent to the Avraham Avinu courtyard (see page 2 above), the area also houses two kindergartens, the municipal committee offices, and a guesthouse; seven families living in mobile homes at Tel Rumeida; twelve families living in Beit Hadassah; six families living in Beit Schneerson; one family living in Beit Kastel; six families live in Beit Chason; Beit Romano, home to the Shavei Hevron yeshiva, is currently being refurbished. Local administration and services for the Hebron Jewish community are provided by the Hebron Municipal Committee, which was established by the Defense and Interior Ministries, and whose functions are similar to those of Israel's regular local councils. The Ministry of Housing and Construction has established the "Association for the Renewal of the Jewish Community in Hebron," to carry out projects in the city. The Association is funded both through the state budget and by private contributions. It deals with general development of, and for, the Jewish community. In addition to the Tomb of the Patriarchs, Tel Rumeida, the Jewish cemetery, and the historical residences mentioned above, other Jewish sites in Hebron include: 1) the Tomb of Ruth and Jesse (King David's father) which is located on a hillside overlooking the cemetery; 2) the site of the Terebinths of Mamre ("Alonei Mamre") from Genesis 18:1, where God appeared to Abraham, which is located about 400 meters from the Glass Junction (Herodian, Roman, and Byzantine remains mark the site today); 3) King David's Pool (also known as the Sultan's Pool), which is located about 200 meters south of the road to the entrance of the Tomb of the Patriarchs, which Jews hold to be the pool referred to in II Samuel 4:12, 4) the Tomb of Abner, Saul and David's general, which is located near the Tomb, and 5) the Tomb of Othniel Ben Kenaz, the first Judge of Israel (Judges 3:9-11). In January 1997, after nearly thirty years of occupation, the Israel Defense Forces (IDF) withdrew from some 80 percent of the Hebron municipal territory. This redeployment, originally agreed upon in the Interim Agreement (Oslo II) of September 1995, was postponed for several months, until a new agreement - the "Protocol Concerning the Redeployment in Hebron" - was reached. In the meantime, most of the biggest West Bank cities had already been handed over to the Palestinian Authority. In the Hebron Protocol, a distinction is made between Hebron's "H1" and "H2" areas. The status of the largest part of the city, "H1", is similar to the one pertaining to "Area A". The Palestinian Police Forces (PPF) exercise full control over "H1", while the IDF are not allowed to enter, unless escorted by Palestinian security forces. Yet, the IDF maintain indirect control over this part of the city, by occasionally establishing checkpoints at entrances to the city, or by closing these points of access. "H1" covers residential sectors as well as the commercial areas of Bab Al-Zawiya and Wadi Al-Tuffah, situated west of the Old City. In the remaining part of the city, "H2", Israel maintains military presence, as well as control over various aspects of Palestinian daily life. Palestinian civil institutions operate under certain restrictions imposed by the Israeli military administration. When it comes to the PPF, they are only present when they participate in joint patrols led by the IDF. "H2" covers approximately 20 percent of the municipal territory. It comprises the entire Qasba and areas adjacent to the Jewish settlements. The population in this area is composed of an estimated 30,000-35,000 Palestinians and approximately 400 Jewish settlers. This relatively small sector is the geographic, economic, historic and religious center of Hebron. One main road runs through "H2" and connects the western to the eastern part of the city: Al-Shuhada Street. The traffic on this street, where three of the four Israeli settlements of Hebron are located, is tightly controlled by the IDF. Various restrictions are imposed on Palestinian motorists who want to use it. A bus station used to be located along Al-Shuhada Street. This popular meeting point was closed in 1986 and subsequently turned into an Israeli military compound. To this day, these successive measures have led to the virtual extinction of the economic activity along Al-Shuhada Street. In spite of being located inside the Israeli-controlled area of the city, the Souq situated inside the Qasba and behind Al-Shuhada Street remains one of the busiest in the West Bank. However, the wholesale vegetables market (Al-Hisbe), adjacent to the Souq, has also been closed by Israel, due to security considerations. The Qasba itself is no longer among the most densely populated areas of the city. Since the first half of the twentieth century, its population dropped from 8,000 to a few hundred. To reverse this evolution, the Palestinian local authorities have, since 1997, made a continuous effort to renovate, rehabilitate and develop the Old City. This led to an increase in the number of families moving into the Qasba. Similarly, efforts are being made to highlight its cultural heritage. Located northeast of the Old City, the Ibrahimi Mosque/Cave of Machpela is included in the area under Israeli control, as are Islamic institutions, and a number of old mosques. The question of the Ibrahimi Mosque/Cave of Machpela is among the most sensitive issues in the Palestinian-Israeli conflict. The sanctuary is dedicated to Abraham, the patriarch of both Arabs and Jews. Deep-rooted in Jewish tradition, the history of the Cave of Machpela takes on a special importance, as the site is believed to be the first piece of land bought by Abraham in the Promised Land. Since the Islamic conquest of the region, in the seventh century, the site is predominantly revered by Muslims as Al-Haram Al-Ibrahimi, the Abraham Sanctuary or Ibrahimi Mosque. For seven centuries, its access was restricted to Muslim worshippers only. Jewish pilgrims were allowed to pray at a special location, outside the building. During the 1967 War, on the same day the Israeli troops entered Hebron, the IDF chaplain placed a Torah scroll inside the Mosque. This initiative made it possible for Jews to hold prayers and religious services in various parts of the sanctuary - sometimes at the same time and place as the Muslims. This move raised a wide indignation among the Arab public opinion and Muslim clergymen. According to them, the installation of a synagogue inside the sanctuary challenges the Muslim character of the site. The recent history of the site was marked by the massacre of 29 Muslim worshippers by a Kiryat Arba settler, Baruch Goldstein, in February 1994. The killing was denounced through Israel. An Israeli commission headed by Meir Shamgar examined the circumstances of the bloodshed. Its recommendations led to a number of new arrangements, such as the establishment of a physical separation between the worshippers of the two communities and the tightening of the security checks at the entrances. It was also decided that on an equal number of days a year, the Ibrahimi Mosque/Cave of Machpela would be reserved for members of one community only. Every year thousands of Jewish Israelis and visitors come to Hebron and the Tomb of the Patriarchs to mark the reading of the Torah portion Chayei Sarah (Genesis 23:1–25:18) which discusses Abraham’s purchase of the Cave of the Patriarchs to bury Sarah. At least 40,000 Jews gather in Hebron to mark biblical purchase of Cave of the Patriarchs, JTA, (November 4, 2018).